What learning institutes need to impart to all professionals this essential personal skill. Be in office when u must. Be in the field when u must. Striking the right balance with correct timing is the key to responsive administration. Learning Institutions must impart this essential skill to all professionals. It's true of both public and private sector. A stitch in time saves nine. Early intervention helps prevention. And timely intervention checks further decline. In the Government sector it assures people of a responsive governance which is transparent. In the private sector it establishes leadership with concern for quality and care. All these qualities are needed in all public services anyway. Equally applicable in personal or social issues. Situations only vary. It's not the selection only that is critical but who does the CVO report to. 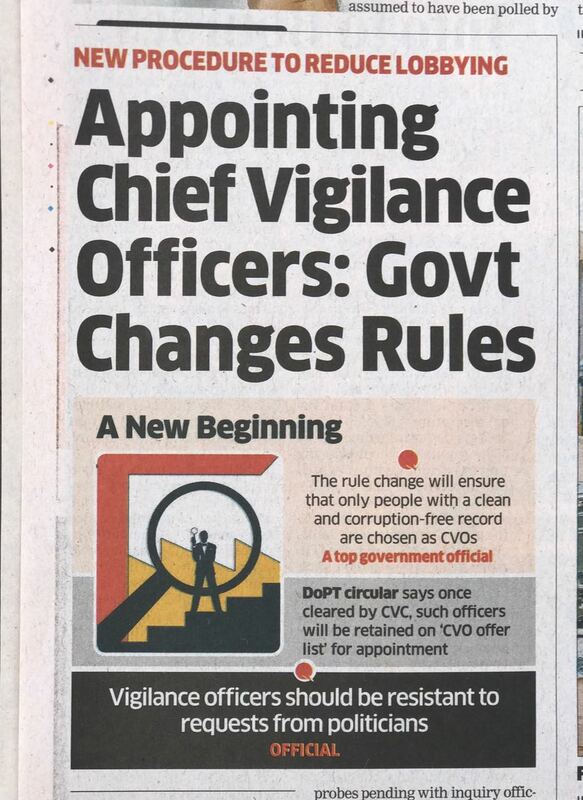 If as CVO he/she is also a CS and reports to CM is conflict of interest. 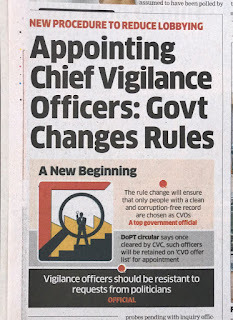 To ensure independence and higher accountability of the CVO the officer is not only to be clean but also clear of his own conduct and also clear of reporting pressures from his next senior. It's the annual appraisal from the next senior which inhibits exposures. Which is why CVOs are seen more going after small fish not the sharks..When info of sharks and crocodiles is in public domain. These insecure CVOs go after rats and mosquitoes..Infact such placed CVOs are seen to be afraid of even an inquiry if it is concerning their own boss/es. Hence we need to carefully examine who do they report to and what independence of reporting the CVOs have. My suggestion would be that CVO work ought not be combined with any other to avoid more supervisors. And they must report to CVC. This is what will bring the much needed respect and fear required in administration today. 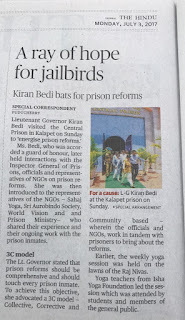 When leadership can act as deterrence... against corruption in jails. So much being exposed about corruption in jails. It's bound to be there wherever there is no transparency in its living and oversight. Any leadership which wants to check corruption will ensure the following. 1 optimum use of technology. Install cameras all over and save recordings of it to be viewed and stored as evidence. No one escape the eye of the camera. 2. Visit the Prisons regularly, personally. 3. Install feedback systems which protect whistle blowers. 4. And take need based action on feedback. 5. Bring in spirituality training in prisons not only for prisoners but staff too. 6. None of the above needs more budgets. 7. We can begin with what we have. 8. Try these few measures to begin with. 9. Key is, does the leadership want integrity??? Never realised that being a Functional Governor and being People Sensitive would cause so much of distress to some? --Going by what has appeared in the papers today in Puducherry. I am in Delhi today on the invitation of our Honorable President bidding farewell to all Governors and Lt Governors and Administrators. It's so evident that going along with status quo is more acceptable to some. And changing things for the better is disturbing. Which is why many choose a safe route of No Change. Play safe. And let people suffer in so many ways. I have seen this in al my life so far. But I have believed in solutions for the benefit of people who we are meant for. Hence none of this comes as a surprise to me. I am for a duty to be done and will keep doing as per the laws and the rules. The Judiciary is the final arbiter. We can always go to it. Let truth prevail. I shall be back in Puducherry to resume my duties day just after another day. Such like deficient services do not do good to respect for governance. All seniors concerned ought to pay attention to matters which affect a common person the most. 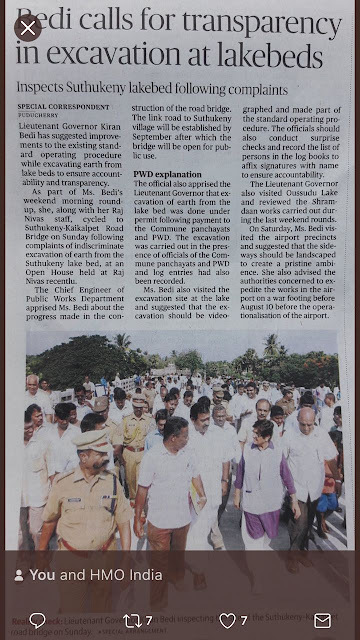 If officers can find time to travel officially for several tours inside and outside Puducherry, and India, surely they can do so for issues pending which concern ordinary people. Records of these deficiencies have been kept in your respective files and may get reflected in the annual appraisals due shortly. Certainly in those where I am directly the accepting authority. And also in others as a record in their files. For information for future recall. Please do not take me lightly. I am sorry to note some of you are not getting the grasp over the situation. For whatever reasons. Some visible some known only to you. You are delaying required field work. And also resolving them or seen to be. All of my ninety weekend morning rounds are evidence of your performance or non performance and will be taken into account when reviewing your work. You have another year ahead hopefully with me. You do not have a choice with me my friends. It is my duty to distinguish performance from non performance. Or else I shall be unfair to those who did do against all kinds of odds. I have been telling you this directly or indirectly. Some took it seriously some are still taking chances. Such like deficient services do not do good to respect in governance. All seniors concerned ought to pay attention to these. If they can find time to travel officially for several tours inside and outside Puducherry, and India, surely they can do so for issues pending which concern ordinary people. The above pointed deficiency in service is just one instance. It's become a tipping point. This one was pending and concerned had assured it to be corrected. Yet no system worthwhile was found in place. When simple things were possible without financial investments. I have seen by now far took many in my last one year of working with you. Hence make no mistake. Unless individuals concerned improve considerably, you alone shall be responsible for your reports which will stay with you forever. No amount of your defence will work because it shall be based on my direct inspections or visits too. I wish you all well. Please cooperate and get out of comfort zones. Public service demands sacrifice of personal time as well. Which is why you came into it in the first place. Systemising prison reforms in Puducherry to check recycling of crime.--The 3 Cs Model. Along with Swachh Rallies, Yoga learning from RajNivas, opening up of RajNivas to People of Puducherry and putting in place strong vigilance systems and more, Team RajNivas has included focus on residents behind bars. Which is the Puducherry prison. Object is to ensure prison works as a reformatory not a place of recycling of crime and contamination. Once released he then shall be a valuable member of the society. As a strong crime prevention and rehabilitation measure the released prisoner will be linked with the police beat officer of who will ensure close watch so that the released prisoner does not slip into alcoholism or bad company. This will ensure methodical community policing in the real sense. The Prison reform model will be a 3 Cs based. It shall be Collective, Corrective and Community based. 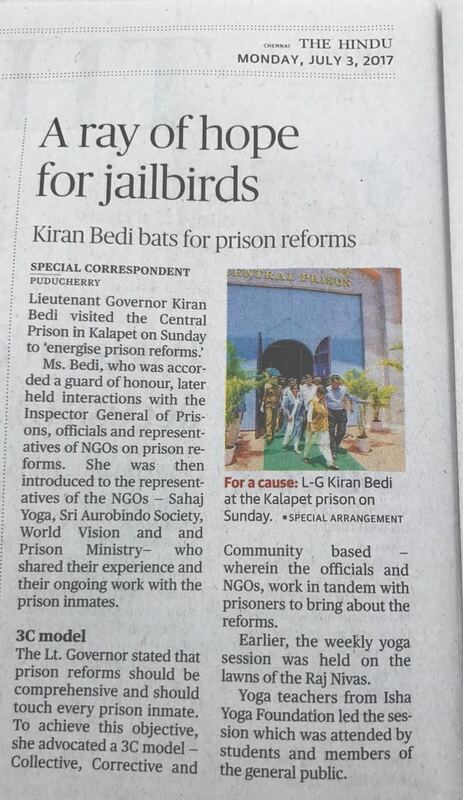 Educated and skilled prisoners inside along with missionary NGOs will be teamed up with. Donations of Old Schools books shall be sought from schools to provide books to all inmates according to their need. ( no cost to the Govt in any way). Yoga and hobbies too shall be NGO and CSR supported. Puducherry Prison will be taken towards systematic and sustainable prison reforms.